ChordMapMidi, from originally released in 2012 by Malcolm Mugglin, was updated for the first time ever! 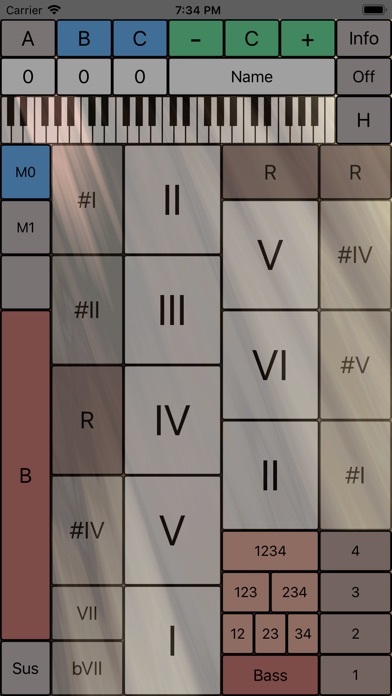 This update is a complete redesign of the chord MIDI controller app. ChordMapMidi (midi controller app) has been redesigned. There are now two maps. Map 0 plays power chords (root and fifth). Map 1 plays three-note chords in major keys, and can be switched to play in relative minor or parallel minor. A "Tap Keyboard" has been added just above the map area. (Tapping on the keyboard triggers notes that are consonant with the chord currently chosen). A "SideBar Keyboard" with a slider has been added at the left edge, allowing the user to move the chord-playing region higher or lower in pitch. Can't wait to get home and check this out. This is the BEST chord tool I've ever used. Granted, the interface is kind of like a Ouiji Board and about as arcane, but once you get it, it's AWESOME to use this tool to send out note info to multiple channels... Chord1 to ch1, chord 2 to ch 2, bass to ch3, etc. etc. I love that comment! You could write for discchord! bII (rather that #I), bIII (rather than #II), etc. For the same reason they used bVII rather than #VI. The light effects on the GUI are cool.